SPECTREOUTREACH.com: INCOMING GRENADE: DUCK FOR COVER! INCOMING GRENADE: DUCK FOR COVER! Everyone (including myself) these day has big urge to blow thing or virtual people by either online playing games like Call of Duty 4 or in real life if possible (*wrong and illegal*) as a way to release their tension from work stress or perhaps their D-I-Y way of blowing their personal problem away. Then we need an "Hand Grenade Alarm Clock" from Toyo Trading to blow up the morning blues away to ash with BANG! literally speaking, of course. 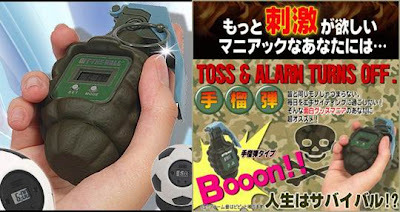 (Note: the Hand Grenade Alarm Clock HAS to be thrown If you want to stop the alarm from buzzing non-stop!) What a great way to start the morning every single day and perfect match for the Dangerbomb Clock! SPECTRE MUST PER-ORDER ONE for Christmas!Yi-hahaha! Spec, got invites to Halloween? ?